In Hinduism, Indra Dev is the king of the demigods or devas and rules the abode of demigods. Today, Indra is no longer an important Hindu god but He enjoyed immense influence during the Vedic period. Below are some facts about Indra - more than 15 important facts. In Vedas and early Vedic age, Indra was one of the most powerful gods but was never considered or related to the concept of Brahman or Supreme Truth, which is the guiding principle of Sanatana Dharma (Hindu religion). In the early Vedic age, he was mostly prayed to for the protection of cows and other wealth as he is believed to have controlled elements like rain, thunder etc. The parents of Indra are sky god Dyaus Pita and the earth goddess Prithvi. Indra is the leader of the Devas or demigods and the god of war, the god of thunder and storms. His weapon is Vajra, the lighting bolt or thunder. 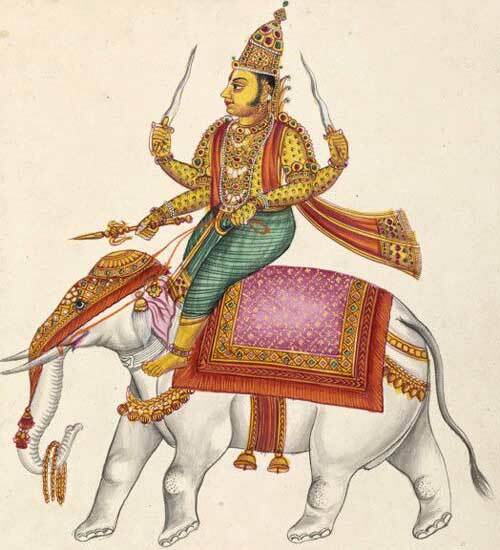 His vehicle or Vahana is Airavat, the white elephant. The most important story associated with Indra is that of him defeating Demon Vritra. But here too the sacrifice of Sage Dadhichi is given more importance today. The sage sacrificed his life to make the weapon, Vajra, to defeat demon Vritra. In Hindu Puranas, Indra is constantly defeated by various demons and always runs to Brahma, Vishnu and Shiva for help. He is constantly thrown out of his kingdom by demons and is reinstated by the Trimurtis (Brahma, Vishnu and Shiva). There are numerous stories associated with Indra which explains why human beings should not nurture anger, lust, jealousy, insecurity, hatred etc. The end of the worship of Indra came during the incarnation of Vishnu as Lord Krishna. It was Krishna who asked the people of Vrindavan to stop praying to Lord Indra. An angry Indra sent torrential rains flooding Vrindavan but the people and their cattle were rescued by Lord Krishna who lifted the Govardhan hill and gave them shelter. Symbolically, Indra was the personification of elements in Nature over which human beings had no control. But later developments removed the fear on Nature. This led to Indra losing power. Bhogi Pongal festival observed in South India in January is associated with Indra and is known as Indra Vizha. But people no longer associate the festival with Indra. Indra puja is also observed in Mithilanchal and Odisha in India and Nepal. But there are no elaborate rituals associated with them. Today, Indra is very rarely worshipped in Hinduism. He is mostly remembered in divine acts performed by Shiva and Vishnu to reinstate Him as the king of the demigods or devas. There are also stories in Puranas which state that during a cycle of creation numerous Indra's are replaced. It is said that when a hair falls from the chest of Shiva an Indra is replaced. Thus today there are people who believe that Indra was a mere title given to the king of demigods.